Welsh Cyclist Geraint Thomas Wins Tour De France Thomas emerged from the shadows as a support rider for teammate and four-time champion Chris Froome to become the first Welshman to win the tour. 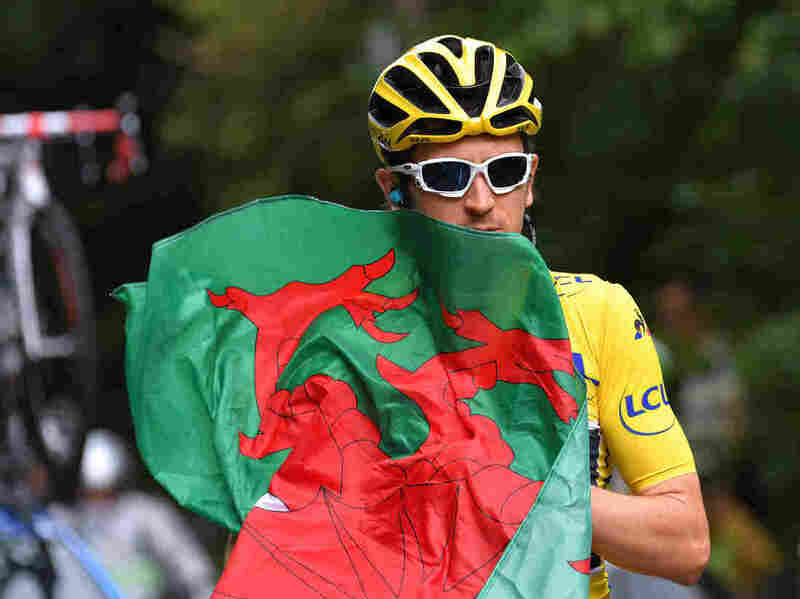 Geraint Thomas of Great Britain carries the flag of Wales during the 105th Tour de France 2018, Stage 21 stage from Houilles to Paris on Sunday. According to Cycling News, "After the customary champagne and photo opportunities during the first half of the stage, things - as they usually do - got serious once the peloton hit Paris. A six-man break got away early on the Champs-Élysées circuits, but with the sprinter's teams keen to take the glory on the Tour's last day, they were hunted down with 6.5km (4 miles) to go." "It's going to take a while to sink in," Thomas said before draping the flag of Wales over his shoulders during the podium ceremony, according to The Associated Press. "Normally that stage is really hard but today I just seemed to float around it. I had goose bumps going around there. The support from the Welsh, British flags. ... To ride around wearing this (yellow jersey) is a dream." "French rider Sylvain Chavanel, riding his record 18th Tour, rode ahead of the pack as the first rider onto the Champs-Elysees. World champion Peter Sagan matched Erik Zabel's record by winning the green jersey points competition for a sixth time. French riders Julian Alaphilippe and Pierre Latour secured the polka-dot mountains jersey and best young rider white jersey, respectively." Thomas was a support rider for Froome's four earlier Tour de France victories. As ESPN writes, "This isn't the first time a loyal support rider has emerged from the shadow of his former leader." ESPN, noting a "lack of tension" between Thomas and Froome over the role reversal, says Thomas "prevailed because Froome wavered, but there's more to it. Sky has the deepest pockets ($40 million, twice that of the next-richest organization) and correspondingly deepest bench in the business. In the highest mountains, incandescent 21-year-old Colombian talent Egan Bernal worked for both men." As NPR's Bill Chappell wrote last week, for Froome, it had been "a race of misadventures." One incident came on Wednesday when Froome, wearing a dark gray rain jacket over his racing jersey, was yanked off his bike by a police officer who mistook him for a fan riding the course.